Why are so many of your friends and family choosing SMARTBOX for their self-storage needs in Cecil County? The answer is simple: we make moving and storage easy. We provide storage and moving services anywhere you need them. So stop worrying about your moving and storage needs and get back to doing what you love most—whether that’s enjoying the country side or catching fish in the Chesapeake Bay! What makes SMARTBOX your best option for storage? Our process is designed to make the moving and storage process convenient for you! After one monthly fee, you can take all the time you need over that month to pack your box. Store it at your place, or call us to pick up your SMARTBOX. We can bring it back to our temperature controlled storage facility or move it directly to your new destination. We can move your unit across town, across Maryland, or across the country to 88 cities. RESERVE YOUR BOX NOW! Give us a call at 301-683-6111 or fill out the form on this page to reserve your portable storage containers in Cecil County today! With conventional self-storage facilities, you have to pack your car or truck with your stuff, travel across town, find your unit, unload your stuff, and then drive back to your home or office. With SMARTBOX those days are over! Our unique portable storage boxes take all of the hassle out of the moving and storage process because we’ll bring storage wherever you need in Cecil County! Our storage pods can be brought right to your location, so you never have to drive across town—and you only pay for what you use! 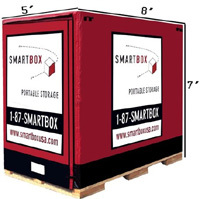 Our SMARTBOX portable storage units are just the right size, meaning you don’t end up with wasted space. If run out of room, you can have another storage pod container delivered to your location in Cecil County. Load and unload on your schedule, and avoid late fees and penalties for taking too long. It’s storage and moving for the 21st century. Our portable storage containers are weatherproof, so you can leave them at your location Cecil County, Maryland. Or if you want to store them at our state-of-the-art, temperature-controlled facilities, all you have to do is make the call. We will promptly pick the storage units up and keep your belongings safe and sound until you need them. We offer a wide range of portable storage solutions for those living in Cecil County. Some of the most common reasons people come to us include: affordable storage, best storage, mini-storage units, mobile storage, office storage, outdoor storage, public storage, storage boxes and containers, storage rates and prices, storage quotes, storage solutions, storage space, and temporary storage. Reserve Your Storage in Cecil County Today! If you’re looking for a storage and moving company in Cecil County, MD, SMARTBOX is here for you. We can handle all of your storage and moving needs, and we’ll make the process simple! And don’t forget to check out our coupons page to find great savings on your portable self-storage and moving services! Contact us online or by phone today at 301-683-6111 to reserve a unit in Cecil County, Maryland!